Sam and Dean Winchester are officially back, and they sure do have a lot on their plates. Basically, Supernatural Season 12 isn’t starting out so great for either of them. First, not only did Toni Bevell (from the British Men of Letters) shoot Sam, but she kidnapped him and is torturing him in horrific ways. Though, I’m pretty sure most fans weren’t upset about seeing Sam drenched with water. For those who need a refresher, refer to the GIF below. Unfortunately, Toni still has Sam locked up, but there is good news. Dean is on his way to save his baby brother. He even has a little help from both Castiel and Mary. Oh, yes, Mary Winchester is back in the flesh. Dean was definitely shocked to see his mother, who didn’t even recognize him. Remember, Dean was 4 when she died and Sam was only a baby, so those are the only memories Mary has of her boys. So much has changed since she died 33 years ago, and Mary has a lot of catching up to do. Not to mention, she has to adjust to a completely new world. Thankfully, she has Dean and Sam to help her out with that. It really is wonderful to see Mary again, especially since Supernatural can always use a badass woman, right? That is certainly Mary. Actually, while watching the Season 12 premiere, did anyone else notice how much Mary and Dean have in common? If you didn’t know them or watch the series, you would absolutely pick up on the fact that these two are related. If you thought Dean and John were alike, it sure seems like Dean has more similarities with Mary. From beginning to end of Thursday’s episode, watching Mary was like watching Dean. Here’s how much they have in common. Neither Dean nor Mary backs down from a fight. 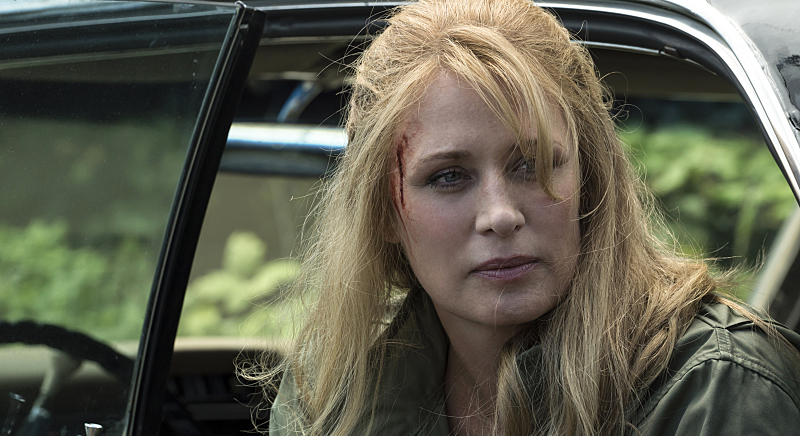 Did you see how Mary took down Dean during their first meeting? As much as Mary may not want to admit it, she is a hunter at heart. She’s also amazing at it and hasn’t lost her touch after being dead for over three decades. Mary is going to make a great asset alongside her boys. Mary returned in her famous white nightgown, but thankfully, Dean got her some real clothes. Either he stopped at a store for her where he/she selected Dean-like clothing or he had something in the trunk because Mary’s outfit in the premiere screamed “Dean.” Seriously, they were dressed pretty much exactly alike. Mary’s reunion with the Impala was so wonderful. She treated Baby with kindness, couldn’t stop smiling and even called her “sweetheart.” Mary and Dean love that car, and would never let anything happen to her. Dean’s reaction (above) upon seeing Mary staring at the backseat of the Impala and smiling was perfection. Yes, Dean, even your mother got in on in that car at least once in her lifetime before she died and came back to life. At times, Dean can be both emotional and vulnerable, which is exactly what Mary demonstrated at the end of the episode. In addition to coming to terms with being resurrected and getting used to her surroundings, she is also now being thrust back into the hunting life that she ran away from. Plus, she didn’t want this for her boys, no matter how much they might like it. Mary sure has a lot to deal with. It’s just the Winchester way, isn’t it? Yeah, Mary and Dean are definitely mother and son. More: Um, was that [spoiler] Supernatural just brought back from the dead?